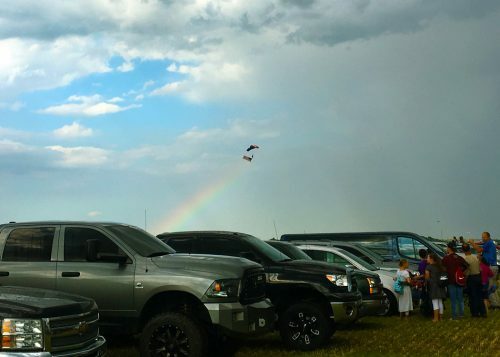 GOSHEN – Goshen hasn’t had a roar in its skies like Saturday in nearly a decade. 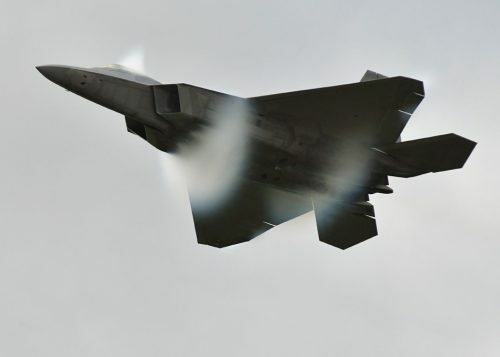 America’s Freedom Fest took to the air, withstanding a quick drenching before the airshow got off the ground, but leaving a very well-attended audience with a better sense of the air superiority the United States has held for generations. 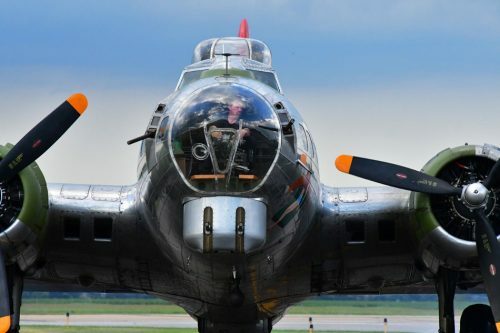 Some of the grandfathers of the Warbird generation were in attendance, the majestic B-17 and the spunky P-51 as well as a host of Warbird cousins that served in a handful of demonstrations. The Mustang also took center stage as part of the much anticipated Heritage Flight, joined by the awe-inspiring F-22 Raptor for a series of photo-opportunity passes before each split off for their own capability demos. 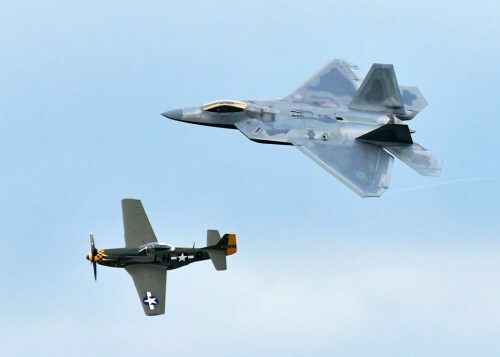 The Mustang, one of the heroes of World War II, and the Raptor, the United States’ newest and baddest air defense weapon, stole the show, likely the Raptor the most with his pair of high-speed passes and a quick flick of the wrist by Major Daniel Dickinson sending the Raptor high into the sky, quickly reversing directions to a gasping crowd. 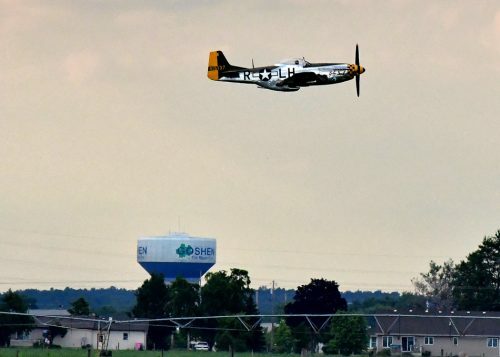 The Raptor made the ‘fly-by’ stop to Goshen as part of an air show stop this week in Battle Creek. Dickinson and his Raptor are stationed at Langley Air Force Base in Langley, Va. Vlado Lenoch piloted the P-51 in the Heritage Flight. 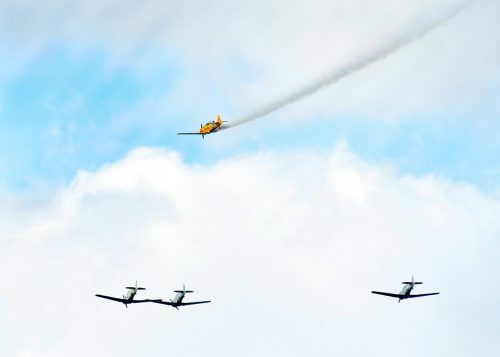 Among the other air attractions at America’s Freedom Fest were an F-86/Mig-17 Korean War era demo and F-100 solo flight, Shockwave dragsters – jet-powered drag racers that left fans covered in exhaust and partially deaf during their initial entrance – a helicopter racing a Goshen police truck, several barnstormers and a night filled with fireworks as dusk set in at Goshen Airport. 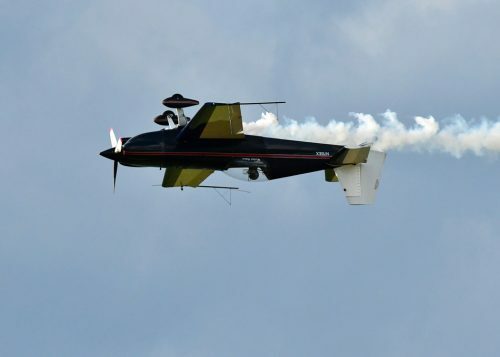 Saturday was Goshen Airport’s first full-scale air show since 2007. 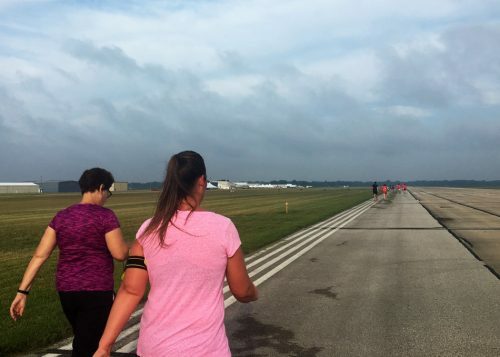 The day opened with a 5K run on the runway. Overall race winner was FG Garcia, posting an 18:06.06 championship run. Female overall winner was Kate Peterson with a time of 21:24. Runner-up male was AJ Miller at 18:08.73 and runner-up female was Chynzie Howell at 21:39.51. 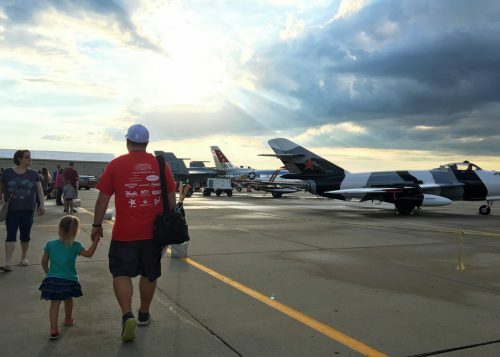 In all, 136 runners and walkers took part in the first running of the race, which had competitors travel along the two lengthways of the runways and back to the finish line.